With nine facilities located in France (Evreux and Saint-Nazaire), Canada (Laval and Boisbriand), the US (Kansas-City), Denmark (Copenhagen) and Hungary (Veszprém, Budapest, Szeged), Citoxlab Group offers a comprehensive range of preclinical services to meet the needs of pharmaceutical, biotechnology, medical device, chemical and agrochemical companies worldwide. Citoxlab carries out studies in general and reproductive toxicology, carcinogenicity, immunology, pharmacology, pharmacokinetics and bioanalysis/biomarkers. Citoxlab and Atlanbio also offer both preclinical and clinical bioanalysis and biomarker services. AccelLAB provides efficacy and safety studies in medical devices (cardiology, ENT, orthopedics, and regenerative medicine). With Solvo Biotechnology joining the Group, products and services in the field of transporters and DDI are now available. 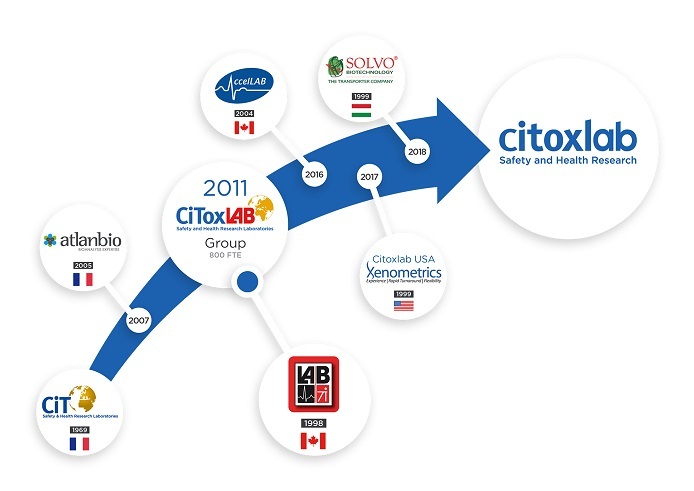 Today, Citoxlab has 1,300 employees working at nine sites with state-of-the-art facilities. The company has a world-class, top-level management team in scientific, financial and business activities. Please click here to visit Citoxlab website.